Hope everyone had a successful season I know it was kind of a weird year for us as many of the mature bucks we were expecting to see were no shows. But same as previous years a new year has begun and I'm already excited thinking about a few new spots to put some blinds. So take everyone along on your adventures west and post any pics or feed price info or anything you'd just like to share. Good luck to everyone be safe and have fun ! Can't wait for another exciting year in Sutton county! 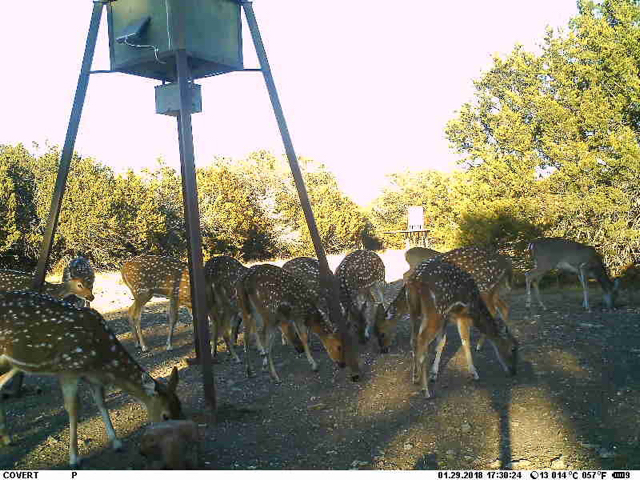 I need to head back out in a couple weeks and fill the feeders back up! 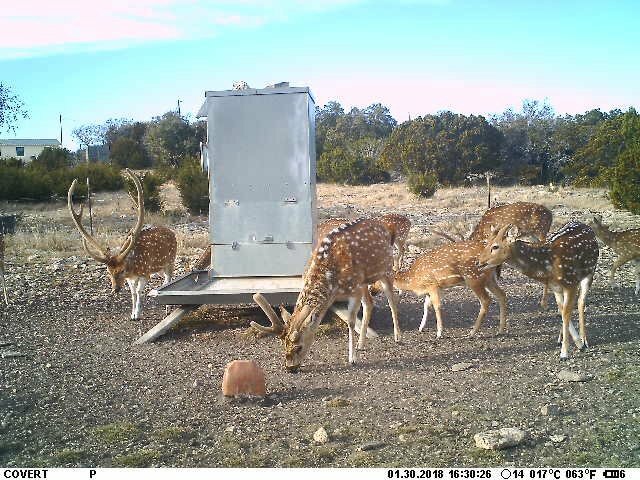 Heading back next weekend to move a couple blinds and top off the protein feeders. Ready to see what 2018 has in store for us. The axis my wife shot is going to be hard to top. It officially knocked off the leader of the LSBA record books by 1/8th". We have some bruisers in velvet now. Can't wait to see what the turn into in the coming months. Looking forward to seeing the progress. Heading back myself in Feb to fill up protein and thin some hogs. Ready for another season! 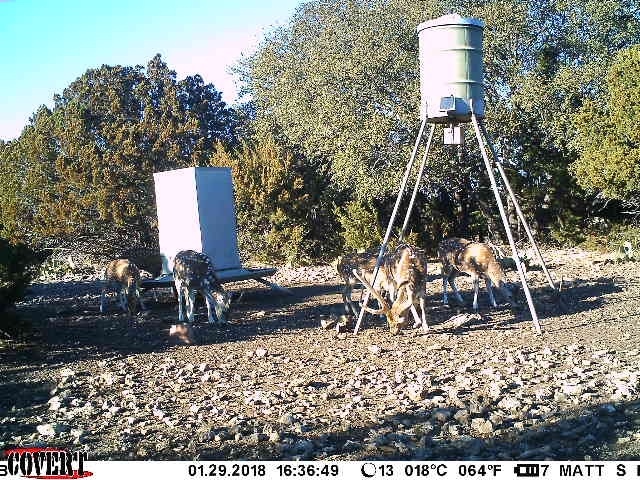 The low fawn crops during the drought years (2008-2012) have slowed the hunting for us. Things should start looking up. Really regretting getting off my lease in Sutton Co. Left to chase bigger deer, and got a *&#*%$ landowner in return. I agree we had to increase our doe harvest greatly this year as our numbers have just boomed the last couple years because of the good fawn crops and we should see a lot more mature bucks over the next few years because of it. We had a good year and have several mature deer going into next year! Just got back and the deer are everywhere. 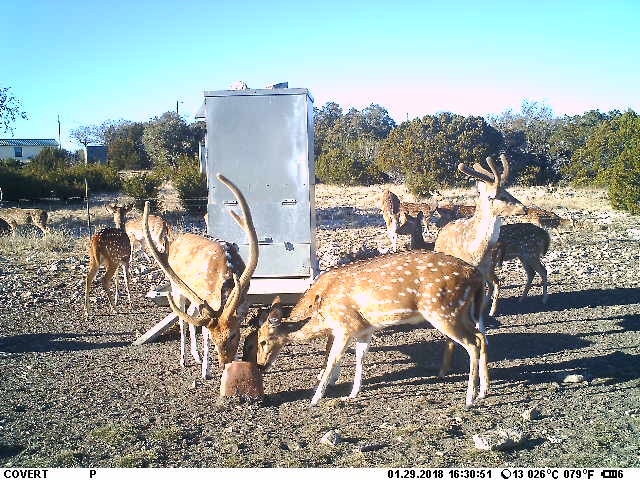 Seen a ton of axis and the bucks are looking good. There is also a ton of hogs hitting the feeders and coming in all hours of the day. All of the deer on my place are hungry!!! They are tearing up the alfalfa. Protein to start in a couple weeks. I know they are bad, but I wish I had a couple pigs to shoot once in a while!!! 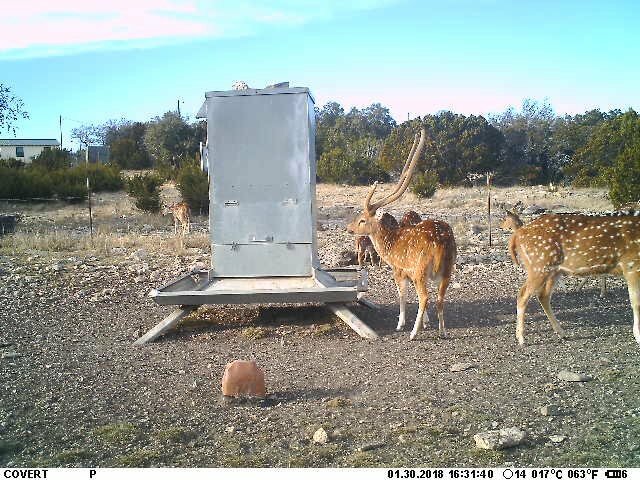 Oh yeah, I saw the first axis on my property about a week ago! It was just a doe, and I did not shoot her. I’m really hoping she went back to all her friends and told them about the new “restaurant” in town! Last edited by Bisch; 01-28-2018 at 10:48 PM. I am looking to join a lease in the Sonora area if anyone gets an opening, I have land owner references if you need them. Supposed to be going to look at a place this coming weekend. Hope the lease manager likes me enough to offer a spot. BrianG had a spot or 2 available last week not sure if he got it filled. Ours too. The axis show up and scarf it down. Hope the axis find your feed. Anyone bought any protein at rafter W lately ? Just wondering what the price is ? Dang stolle you running a feed yard? 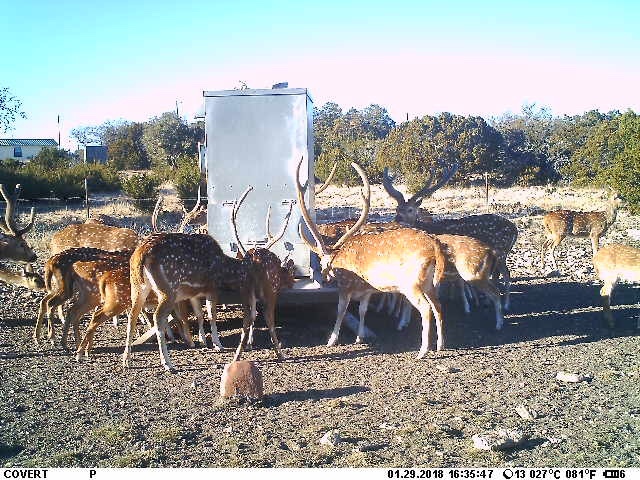 When we are not there they eat like it's a feed yard. It's not as easy to bow hunt them as it appears. We are still semi looking for the “perfect” spot. I'm no axis judge but he's got to be in that 34 inch range. At first, I wanted to say 36", but he doesn't really sweep out or back that much. Easily 34" still though. Nice brows and good mass. I'd choot 'im. Love the Sonora area. My son is off to college next year so I will be looking for a single spot. Most interested in exotics as we have some land in east Texas. Please let me know if y'all hear of any openings. The answer is, "Tall Enough!" In again, we had a great year. We harvested 4 mature bucks and a few does. Our deer numbers where really high this year. Had some young studs we let walk so they should be bruisers this year. Look forward to another exiciting year. 34-35” range or so. Those short tines will probably skew most guesses. Great brows. He looks mature. This will be my first year in Sonora this coming season. We have around 2700 acres with 9 people. 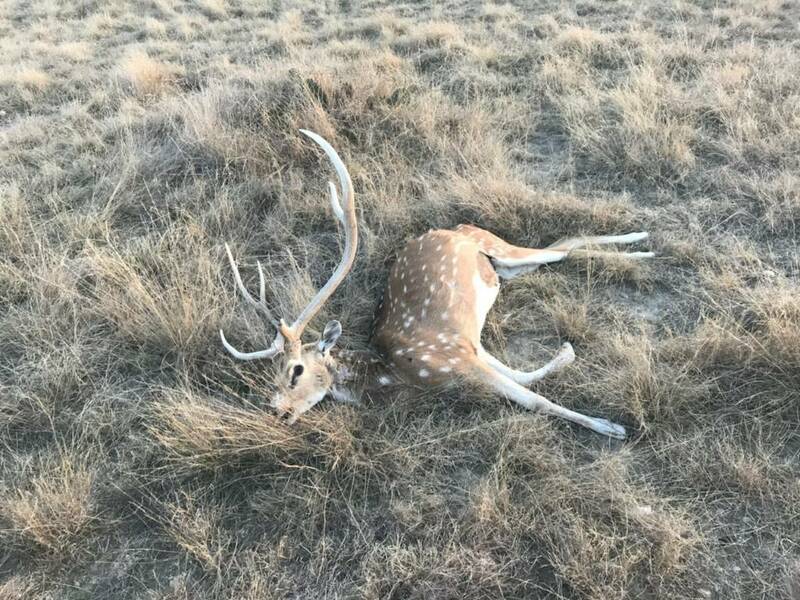 I'll be on the glasscock ranch, haven't looked @ it yet, but my lease manager on my other lease manages this one too. 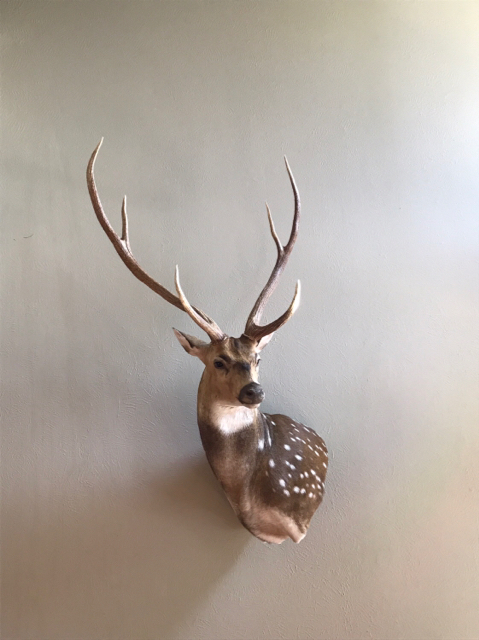 He's shot some nice bucks the past 3 years! Really excited about getting out west! You might be sleeping on the couch if you beat your wife's!!! 34-36" is my guess! They always look better in velvet though. Get after it! He would sure look good on the wall wearing that velvet. Looks about finished out too. Its dry as a popcorn fart, he should be on that feed pretty regular! Another one with a bullet hole. 1/4 mile from the fence. Hopefully it was shot on the other side of the fence and not on our side by a poacher. I figure a poacher would have at least taken the head. Either way, it stinks to lose a young up and comer. Last edited by Shane; 01-31-2018 at 10:40 AM. I'll let him rub out first. Not a fan of shooting them in velvet. Last edited by Stolle; 01-31-2018 at 10:40 AM. Darn. I've found 2 like that on our place and hope it was from fighting or neighbors. We heading out Friday morning for the weekend to fill feeders eat a ribeye and drink a few Barley pops. I called Rafter W today 20% protein was $10.75 and corn was $5.90 if you buy a ton or more. Gonna be close! Congrats to her, heck of an accomplishment! Thanks! I'm very proud of her. She put in many of hours in the stand hunting him. It’s hit or miss. AT&T is a little better. I have a spartan ATT camera and I get perfect service at my place. It’s about 8 miles west of town.